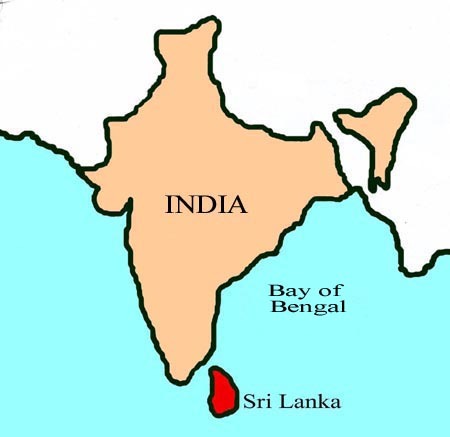 Sri Lanka is an island (colored here in red on the map) located in the South-east of India, in the Indian Ocean, at approximately 31 km (19 mi) of India, in the Northern Hemisphere between 5 and 10° of Northern latitude, the summit of the island is the Pidurutalagala mount which culminates at 2,524 m (8,281 ft). The climate of Sri Lanka is tropical wet. The mountainous regions of the South-West are the most rainy areas. Historically speaking, the island was under the control of Portugal in the 16th century, then under the one of the Dutch in the next century, and at last, it became a province of the British Empire in 1796. Sri Lanka became independent in 1948. All this enables to consider the first introduction of the plant into the island by the Europeans or the Sri Lankans. Moreover, my friend Rémy told me that many inhabitants love flowers and they often travel within their country, which can explain why the plant can be found everywhere.